In 10-inch skillet, cook beef over medium-high heat until thoroughly cooked, stirring frequently; drain well. 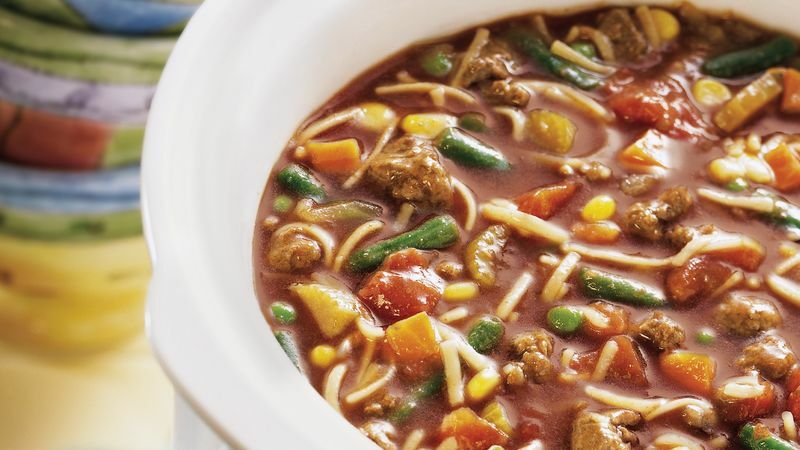 In 4- to 6-quart slow cooker, mix cooked beef and all remaining ingredients except mixed vegetables and noodles. About 20 minutes before serving, stir in thawed vegetables and noodles. Increase heat setting to High; cover and cook 15 to 20 minutes longer or until vegetables are crisp-tender and noodles are tender. *To quickly thaw mixed vegetables, place in colander or strainer; rinse with warm water until thawed. Drain well.